22-Jan-2000 -- PiKapp Legacies Scout Team Log. Members Present: Paul Sanders, Marty Todd, Wesley Sanders, Taylor Todd. Upon roll call at 9:00 am this morning the Executive Directors of the PI Kapp Legacies Scout Team (Paul and Marty) decided after an open door meeting to create a permanent marker for 34° 82° . 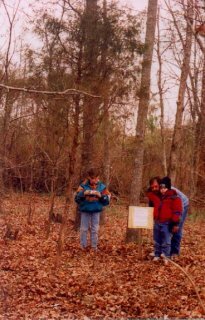 After completing construction of the marker the scout team loaded its navigational aids -- 3 maps 1 compass and one Magellan GPS 300 and proceeded from Augusta, Georgia, to their destination in an unmarked car. We arrived at Mt. Creek road and began montoring the GPS coordinates closely. It became apparent that our destination was located on private property belonging to a Mrs. Gladys Outz. After explaining what we were doing Mrs. Outz granted the scout team permission to enter her property and find our destination.